This list of Massachusetts State Parks contains the state parks and recreation areas in the Commonwealth of Massachusetts managed by the Massachusetts Department of Conservation and Recreation as of 2015. The Bureau of State Parks and Recreation division of Department of Conservation and Recreation (Massachusetts) (DCR) is responsible for the maintenance and management of over 450,000 acres (1,820 sq km) of privately and state-owned forests and parks, nearly 10% of the Commonwealth's total land mass. Within the lands managed by the Bureau of State Parks and Recreation are some 29 campgrounds, over 2,000 miles (3,200 km) of trails, 87 beaches, 37 swimming, wading, and spray pools, 62 playgrounds, 55 ballfields, and 145 miles (233 km) of paved bike and rail trails. DCR's Bureau of Urban Parks and Recreation manages the Metropolitan Park System of Greater Boston, the components of which are included in this list. The park is primarily used for boating and fishing. Massachusetts' highest single-drop waterfall lies within the park borders. Approximately 7.5 miles (12.1 km) of the Appalachian Trail travels through the forest. The park includes a cascading waterfall and a wading pool. The reservation includes landscaped pathways, benches, and an observation tower. A portion of the Boston Harborwalk runs through the reservation. The park is the midpoint of the Blackstone River Valley National Heritage Corridor of the National Park System. The reservation has the distinction of being the largest conservation land within a major metropolitan area. The park that features rolling meadows, lush evergreens and old carriage roads lined with rhododendrons. The reservation is hardwood forest principally used for birding, fishing and hiking. The present fort, built between 1834 and 1851, is the eighth generation of forts and it is one of the oldest fortified sites in British North America. The Chestnut Hill Reservoir Historic District is considered a nineteenth-century masterpiece of engineering, urban planning and landscape design. 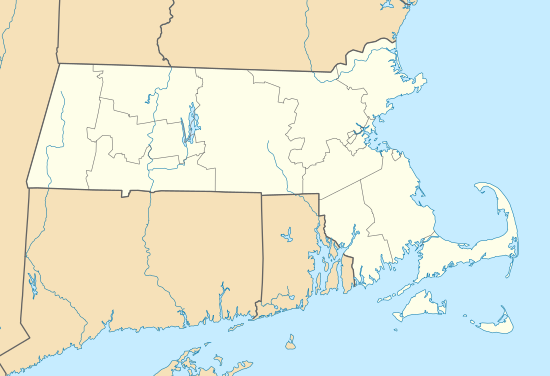 42°10′45″N 72°32′13″W﻿ / ﻿42.17917°N 72.53694°W﻿ / 42.17917; -72.53694﻿ (Chicopee Memorial State Park) 562 acres 227 ha Cooley Brook Reservoir The park includes two 25-acre (10 ha) ponds. It contains the largest remaining fresh water marsh on the middle Charles, and includes a boardwalk through a cattail marsh out onto an island. Dighton Rock is an 11-foot (3.4 m) high glacial erratic covered with petroglyphs and has since been moved to a museum at the park. 42°17′50″N 71°2′44″W﻿ / ﻿42.29722°N 71.04556°W﻿ / 42.29722; -71.04556﻿ (Dorchester Shores Reservation) 44 acres 18 ha Neponset River The reservation comprises two beaches and a park. The 110-mile (180 km) Metacomet-Monadnock Trail passes through a western parcel of the state forest. The park is built atop the restored ruins of the Charles H. Tenney estate. The park features include a visitor center with exhibits about paper manufacturing and Holyoke's industrial and cultural history. Popular for its two-mile (3 km) long sandy beach on the shore of Buzzards Bay. Also camping, fishing and a salt marsh. The Midstate Trail runs through the western edge of the forest. Manuel F. Correllus State Forest Dukes 5,215 acres 2,110 ha 1908 Little Pond In the interior of Martha's Vineyard, the park is the focus of one of the largest environmental restoration projects in the country. A 120-foot (37 m) tower with 125 steps that overlooks Plymouth Harbor and Duxbury Beach. Pitch pine and scrub oak forest with sixteen ponds for fishing, canoeing, swimming. Camping on four of the ponds, bicycle trails, equestrian trails, and horse camping. Natural Bridge State Park Berkshire 44 acres 18 ha Hudson Brook It contains the only natural white marble arch/bridge in North America. The natural bridge spanning Hudson Brook, was formed by glacial melt about 11,000 BC, from 550 million year old bedrock. The Chasm was created when glacial meltwater from a burst ice dam ripped out blocks of bedrock at the end of the last Ice Age (14,000 years ago). Rutland State Park Worcester 284 acres 115 ha Whitehall Pond Swimming, picnicking and boating. The park's main feature is its 3.8-mile (6.1 km)-long beach, one of the most popular in the Commonwealth. On Cape Cod Bay at the east end of the Cape Cod Canal, a popular swimming and camping area. A component of the Waquoit Bay National Estuarine Research Reserve with a one-mile (1.6 km) stretch of beach. ^ "Massachusetts State Parks". MassParks. Executive Office of Energy and Environmental Affairs. Retrieved August 6, 2015. ^ "2012 Acreage Listing" (PDF). Department of Conservation and Recreation. April 2012. Retrieved August 6, 2015. This page was last edited on 10 March 2019, at 21:17 (UTC).